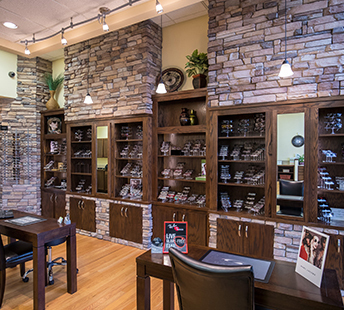 Great Optometrists, Fashionable Eyewear, & Excellent Eye Care. Find It All Here. Welcome to The Eye Gallery, located just off highway 96 and E 21st St in Wichita. At our optometry practice and eyewear boutique you will find today’s latest fashions and styles, with medical services facilitated by state of the art technology. We’ve brought the best of what’s available in the world of eye care to Wichita. We are proud to be a full-service, family-centric optometry practice. Whether you are bringing your child in for their first eye exam, or you are seeking a qualified partner to help control and manage your glaucoma, our practice is perfect for you. From preventative care to eye disease management, we take our role as eye health professionals seriously. Eyewear is more than just an accessory. Your glasses need to do more than simply look great – they need to facilitate great sight, too. At The Eye Gallery, we have hand-picked eyewear brands from all over the world that represent the same values we do: value, style, and performance. You can be assured that an investment in eyewear from The Eye Gallery means that you are wearing some of the best frames available in the world today. You’ll find of over 45 different brands in our office. Our expert opticians will help you find a great fitting pair of stylish eyeglasses or sunglasses from brands like Burberry, Ray Ban, Guess, and Kate Spade. The Eye Gallery is about providing great care for our patients and their families. We incorporate today’s most advanced diagnostic equipment, including the OptoVue OCT and its industry-leading iWellness technology. With such technology at our disposal, we are able to provide you a comprehensive snapshot of your eye health in just a few minutes. Our office is family-friendly and wheelchair accessible- we can’t wait to see you! Our eye exams utilize technology designed to remove the invasiveness and discomfort associated with some eye exams. All our technology is designed to increase your comfort and ensure the exam is a pleasant experience. You can find our office east of highway 96 on 21st, right across from NewSpring Church. There is plenty of parking and easy access into our complex just off of Collective Lane. Dr. Baldwin has been wonderful to us. Her knowledge and thoroughness is very high and her staff are friendly, courteous and knowledgeable. We have been very pleased with the care and consideration we have received from them all. I’ve never had FUN selecting glasses before. The Eye Gallery team is fantastic–who knew that getting new glasses is better than shoe shopping? Dr. Baldwin and her team are amazing. Megan is a top notch optometrist and her team is well-trained and professional. You won’t find a better eye doctor in the Wichita area. What an amazing experience. From the beautiful office, to the knowledgeable staff. The best part was how Dr. Baldwin actually listened to me and cared about the things that I cared about. I’ve had a lot of bad experiences with doctors in the past, but she dispelled them all in my first visit. I highly recommend to anyone. I’ve been going to the The Eye Gallery for 2 years now and find Dr. Baldwin and her staff to be top notch. They are very easy to communicate with and offer excellent service.